Americans as young as age three have been encouraged to engage in physical activity, according to new federal exercise guidelines. 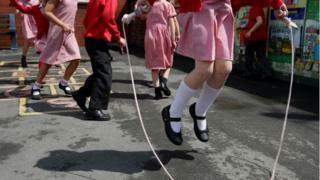 The guidelines, last updated in 2008, used to urge active play from age six. But the US Department of Health and Human Services (HHS) found 80% of Americans are not active enough. America’s lack of activity has resulted in $117bn (£90bn) spent annually on healthcare and 10% of all premature deaths, the update states. Although most of the best practices for physical activity remain unchanged, the update emphasises that any activity is beneficial. The second edition of Physical Activity Guidelines for Americans draws from new research in the last decade that has demonstrated additional health benefits from exercise, as well as more flexibility about how to exercise. In a statement, Dr Brett Giroir, assistant health secretary, said these new guidelines demonstrated that “everyone can dramatically improve their health just by moving – anytime, anywhere and by any means”. One of the major changes from the 2008 guidelines is urging Americans to start young. While guidelines for exercise initially started from age six and up, the new report encourages children aged three to five to have active play sessions of about three hours daily. From the age of six, young people should take vigorous exercise at least three times a week. The previous guidelines recommended 10-minute intervals of aerobic activity totalling at least 150 minutes per week, but experts now say any physical movement can count towards the 150-minute goal. Walking for a block at lunch or opting for stairs instead of the lift are examples of day-to-day activities that now count as physical activity. The update also confirms that physical activity can improve sleep, academic performance, symptoms of depression, anxiety, and general physical function – and that some benefits can be felt immediately. “A single bout of moderate-to-vigorous physical activity will reduce blood pressure, improve insulin sensitivity, improve sleep, reduce anxiety symptoms, and improve cognition on the day that it is performed,” the report states. Risk for diseases like dementia, diabetes and cancers including breast, lung and stomach can also be reduced through physical activity. Exercise can also help manage multiple sclerosis, Parkinson’s and ADHD. What are the different intensities of physical activity? The federal report found US adults spend over 50% of their waking hours engaging in low-intensity activities and less than 1% in vigorous activities. As 30% of the US population engages in no moderate or vigorous physical activity, the new guidelines emphasise the fact that any increase in activity at all can result in “substantial health gains”. Currently, only 26% of men, 19% of women and 20% of adolescents meet the recommendations, according to the Department of Health. And any improvements would also have an impact on the health economy. The 2018 report describes physical activity as a “‘best buy’ for public health”.